In addition to satellite radar data, GlobICE uses data from other sources as inputs to the processing chain, and to validate the ice motion and derived products. • Daily sea ice drift vectors derived from SSM/I and Quickscat, which provide an initial estimate for ice motion at coarse scale (from Ifremer/CERSAT, France). • Daily sea ice concentration from Nimbus 7 SMMR and DMSP SSM/I passive microwave data (from the National Snow and Ice Data Center NSIDC, Boulder, Colorado). • Envisat RA-2 altimeter data processed to give sea ice freeboard (from UCL, London). • Arctic air temperature fields from NOAA-NCEP buoys, used to decide if new ice is likely to have formed in areas of divergence (from the University of Washington). 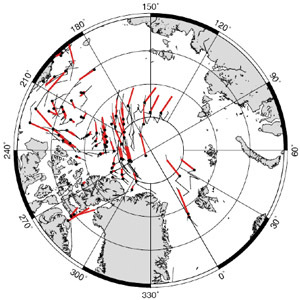 • GPS locations of drift buoys from the International Arctic Buoy Program (IABP), to validate the ice motion product (from the University of Washington). • GPS locations of drift buoys in the Beaufort Sea from the Sea Ice Experiment - Dynamic Nature of the Arctic (SEDNA) from 2007 onwards, to validate the ice motion product (from the University of Alaska).